Having settled on Bribie Island in 1953, Ian Fairweather found a place where he could work consistently and relatively undisturbed, and the last two decades of his life witnessed the production of some of his finest paintings. Living and working in a pair of thatched huts that he had built using materials found in the nearby bush, and painting by the light of a hurricane lamp, his surrounds were primitive, but offered everything that Fairweather needed. While he relished the isolation of Bribie Island and preferred not to engage with the art world in person, Fairweather exhibited regularly at Macquarie Galleries in Sydney, and his work was both seen and admired by curators, critics and fellow artists alike. The 1960s saw his work acknowledged in significant ways, with paintings being included in the landmark exhibition Recent Australian Painting at the Whitechapel Gallery, London (1961), the São Paulo Biennial (1963), the European tour of Australian Painting Today (1964–65) and in 1965, a major travelling retrospective of his work – which included the painting on offer here – was mounted by the Queensland Art Gallery. Fairweather did not adhere to religion in a strict, ordered sense of the word but he recognised the deep spiritual connection and grounding that it could provide, likening the experience of the faithful to his own experience of artistic creativity: ‘Painting is a personal thing. It gives me the same kind of satisfaction that religion, I imagine, gives to some people’.1 In the late 1950s however, he began a series of paintings with religious subjects, or at least, as Murray Bail has observed, titles drawn from the history and well-known stories of Christianity,2 including Last Supper, 1958, Annunciation, 1958, both in the collection of Art Gallery of New South Wales, and Alliluja, 1958, in the collection of National Gallery of Victoria. The ambition of many of these paintings is reflected in their increased scale and Fairweather’s confidence as a mature painter who had hit his artistic stride is clearly evident. Moving easily between his distinctive calligraphic abstraction and more representational depictions, these works seamlessly combine muted colour with layered and richly textured surfaces. The power of these works was recognised at the time by those with a developed and sophisticated eye and in 1966, Monastery, 1961, in the collection of National Gallery of Australia, was awarded the John McCaughey Prize in Sydney. 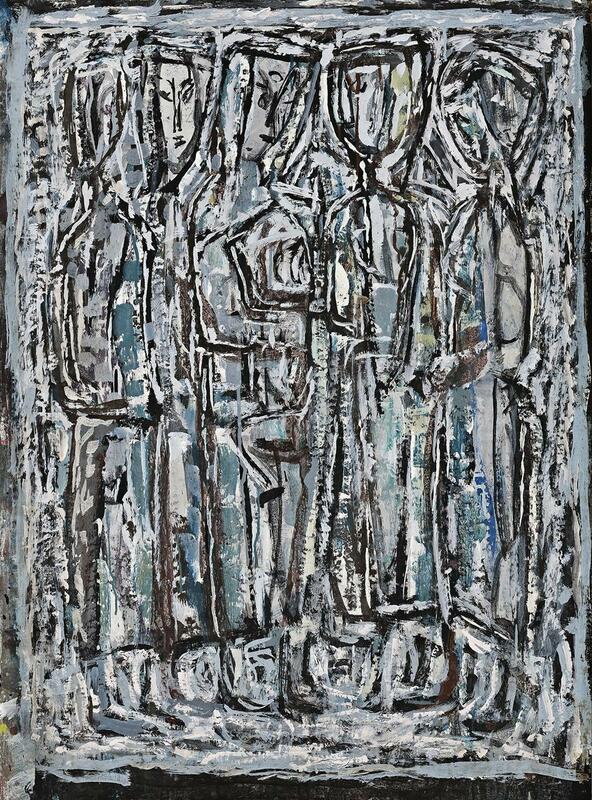 Comprising a dense series of linear strokes of black, grey, brown and white paint, the overall surface pattern of Christmas, 1961 recedes after a time and the subject emerges – five figures standing closely together, the central one holding a baby. The presence of the baby and the title of the work identify this as a nativity scene with the figures representing the Holy Family, Mary in the centre with her head slightly bowed, looking down at the baby in her arms, Joseph and the three Wise Men. There are clues to the diverse influences that shaped Fairweather’s art here, from Cubism, to Chinese calligraphy and the art of Indigenous Australia, but above all else works such as this exemplify the unique nature of his visual language and the singular contribution he made to the development of twentieth century Australian art.